I have been accused many times over the past few years of presiding over a ‘cover-up’ of Bishop Peter Ball’s crimes. Peter Ball misused his office as a bishop to abuse and indecently assault young people who were exploring vocations into Christian ministry. There was, of course, no cover-up. We now know that the police at the time examined many allegations against Ball and together with prosecutors only gave him a caution. This decision was very much of its time. But later, even after I had left office, other people, including police, had an opportunity to look at all the evidence that was in our hands at Lambeth Palace to bring Peter Ball to justice, yet they did not do so until Chichester Diocese passed on its files and Peter Ball was finally brought to justice in 2015. I and my colleagues at the time did make mistakes, and rightly my actions are being subjected to public scrutiny – a review by Dame Moira Gibb and the IICSA Inquiry. I have cooperated willingly, openly and honestly with this scrutiny at every stage. I will take every opportunity I can to publicly apologise to the victims of Peter Ball for the mistakes I made in the 1990s which have caused them such pain to this day. I will say no more about this matter because IICSA is still to report on this next year. The other question is about the role of retired bishops and archbishops. ‘Don’t spit on the deck as you leave’ is usually good advice. But I am not retired from ministry: I am still active in ministry; still a member of the church and, by Her Majesty’s invitation, a member of the House of Lords. If it is permissible to speak out on public affairs, as I do from time to time, then it is permissible for me to speak out on matters of justice when so few others will. Over the last 12 months or so I have had a recurring disturbing worry. It is the ‘nightmare’ that in spite of a very happy and faithful marriage to the same woman for nearly 60 years, some 50 or so years from the point of my death, rumours will circulate that I was an abuser of others. The rumours will reach such a pitch that the Church to which I had given my life will capitulate, pay out money and believe the falsehoods. Who would defend me? This could happen to anyone of us – male or female. It became a reality for one of the great giants of Anglicans, namely George Bell, who died 70 years ago and whom we honour today. I remember as Archbishop visiting Morton’s Tower in Lambeth Palace where Bell’s works were stored. I was amazed by the scale of his correspondence and work. It expressed his energy, output and commitment to public affairs. He was never afraid to be unpopular because his commitment was to the gospel of Jesus Christ and its truth. Before ecumenism became a fashionable word he had already embraced a deep commitment to other Christians and churches. Whilst anti-Jewish hatred continued to change the face of Germany and Western Europe, Bell instinctively turned his face against the ugliness of anti-Semitism. 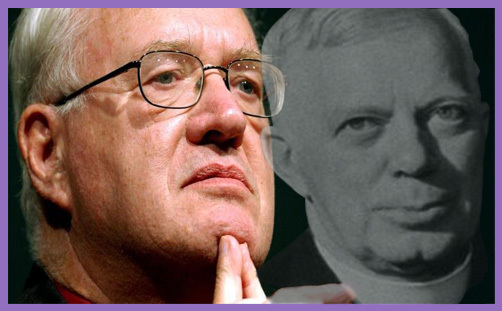 I read his correspondence with Dietrich Bonhoeffer and marvelled at their deep friendship and common faith. At a time of understandable patriotism and jingoism on the part of the British people, Bell courageously argued against unacceptable retribution against Germany. Winston Churchill turned against him and, we understand, put paid to any prospect of Bell becoming Archbishop because of his opposition to carpet bombing. But Bell was more than an energetic, courageous and knowledgeable public figure. He was a man rooted in prayer and worship; a high churchman who loved the order and beauty of liturgy. In his exceptionally busy life he was supported loyally and lovingly by his wife, Henrietta. She was always alongside him, as were his chaplains who there to take some of the burden of his high public office. Of course, if Bell was guilty, his high reputation should not protect him. But we have not been given the chance to establish fairly whether he was. In an appendix devoted to the controversy, Chandler notes that Bell’s 368 volume archive contains his personal notebooks and pocket diaries from 1919 to 1957, in which he kept track of all his appointments and engagements. He notes Bell’s “conspicuously high view of the standards required by his office”, and adds that Bell was almost constantly observed; that he participated in many disciplinary processes for clergy; that he maintained what seemed like a happy marriage, and that he worked almost continually in the presence of his wife, secretary, domestic chaplain, or driver. It was a relief to us all when the Bishop of Chichester asked Lord Carlile of Berriew QC, a well-known independently-minded human rights lawyer, to conduct an independent review, which he did thoroughly and authoritatively. His report concluded that the “core group” established by the church to consider the claims “failed to follow a process that was fair and equitable to both sides”. What then followed was to my mind more damaging to the Church than to George Bell. Instead of this leading logically to the rehabilitation of George Bell’s reputation, the Church compounded the problem further by apologising for the procedures that had been found wanting by the Carlile review, but refusing to retract its conclusion that George Bell was in all probability guilty of the abuse. Now, it gives me no pleasure to note that the Archbishop of Canterbury has received harsh criticism from a number of leading historians and theologians and, sadly, his response has been so far unsatisfactory. Those of us still committed to the national Church remain horrified that not more has been done to explain his remark that ‘a cloud remains’. At the very least, justice demands it. Perhaps an explanation lies in a further allegation which came out of the blue, at the beginning of this year, before the Carlile review could be properly debated in General Synod. The church announced that another core group would be assembled to investigate. But, after the first debacle, can we really have confidence that the Church can investigate this competently itself? At least this time we know that George Bell’s niece is to be represented by one of the George Bell Group, Desmond Browne QC, and that Andrew Chandler’s expertise and knowledge of Bell is being utilised. But a gnawing and perhaps understandable suspicion remains that the hierarchy are hoping we will all forget, and the ‘can’ will be kicked further down the road. It is a sorry mess: justice has been denied and the good name of a great man traduced. One of the matters I am most dismayed by is the silence over these concerns by the House of Bishops. The Church of England has always been respected for scholarship, theological exploration and independent thought. George Bell stands out as a pre-eminent scholar-bishop of the 20th century who engaged in public debate within the church and nation – frequently disagreeing with his own episcopal colleagues. In my time as Archbishop I served with colleagues of great scholarship and distinction including John Habgood, David Hope, Tom Wright, Mark Santer, Michael Nazir-Ali, Peter Selby, Richard Harries, David Jenkins, Hugh Montefiore, David Sheppard, Simon Barrington Ward, and John Taylor of St. Alban’s and many others. These were bishops who prized justice and spoke out when they saw injustice. Bishops who were prepared to speak out even against their own hierarchy – and they did not always agree with me. So why the silence from the House of Bishops? Each member must know that he or she is implicated indirectly in this condemnation of Bell. Only one bishop has distanced himself from the Archbishop’s conclusion, but I understand that at least six others disagree with him. Unity and collegiality are good things, but never should they replace what is right and true. ‘Collegiality’ is not to be mistaken for ‘collective cabinet responsibility’ or ‘party discipline’. So it is right to press the Bishops to declare themselves. Do you share the opinion that a “significant cloud” hangs over George Bell’s name? Do you agree that he is guilty of “great wickedness”? Please tell us what you think. At the February Group of General Synod, Martin Sewell was told that “the House of Bishops is accountable for safeguarding in the Church of England”. If that is the case, why the silence? Is it an honorable thing to be silent on a matter so crucial as this? If the Bishops are at one with the Archbishop of Canterbury’s declaration that a cloud hangs over George Bell’s reputation and that he is accused of great wickedness, let them say so in a collective declaration of support for the Archbishop’s view. It is because we all make mistakes that we need a church that preaches grace, forgiveness, repentance and new life. I see much fear but very little grace in the way that the Church of England has handled allegations against George Bell. Indeed, it is shaming because it is unjust. We know we can do better. That is why this conference talks about rebuilding bridges, and that is why many of us will continue to fight for justice for George Bell.